One cold, dark, and snowy winter day, I decided that I wanted to head a few hours south to find some warm and sunny weather. 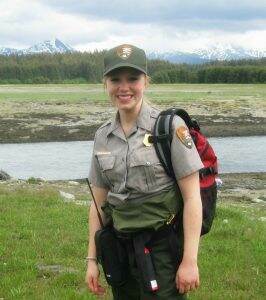 The best vacation in the world for us at Dirt In My Shoes is…you guessed it….a National Park vacation. Excitedly we booked a room at the Historic Pioneer Lodge near Zion National Park and enjoyed an awesome weekend of hiking in 70 degree weather! Ever since that trip (if we are not camping!) we like to go back to the Pioneer Lodge when we are in the Zion area. Supporting local business is important to us, as well as comfort, cleanliness, friendliness, location, and price. This hotel checks off all of those boxes. Here is what you can expect during your stay at the Historic Pioneer Lodge in Springdale, Utah. 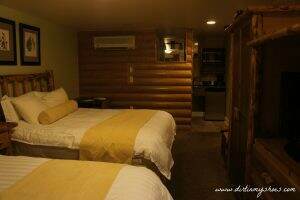 The first time John and I stayed at the Pioneer Lodge, we weren’t quite sure what to expect. We had found an awesome off-season deal so we decided to make a last minute trip of it. 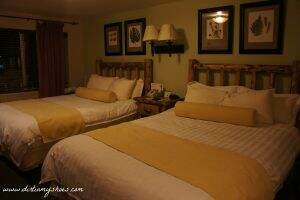 We were elated when we found the rooms to be handsomely decorated, comfortable, cozy, completely clean! Each room comes with a refrigerator, a microwave, plush beds and pillows, and a heating and cooling system. Some fancier suites are available (including a great 3-bedroom family suite), but we have always found the basic rooms to be perfect for our needs. I am quickly learning that traveling with kids makes location a HUGE factor when choosing somewhere to stay. Being just a mile away from the entrance station to Zion National Park, we found the Pioneer Lodge to be a completely convenient home base for us. We could quickly and easily head back to our room and put our baby down for his nap, and then make the short drive back to our favorite hiking spots as soon as he woke up. A shuttle stop for the bus that takes you to the Zion Visitor Center is just down the street. There are also numerous shops and restaurants that are easily within walking distance. Because of the “downtown” location of the Pioneer Lodge, we did find parking to be an issue. The hotel parking lot is small and chaotic and is the only complaint that I had during our stay. I am always trying to make our National Park trips as budget-friendly as possible, so I really love the fact that the rooms at the Pioneer Lodge come with a refrigerator and a microwave. We often pack our own food to save money, so having in-room appliances are a must-have whenever I stay in a hotel. That being said, the Pioneer Lodge conveniently has its own restaurant that serves up typical American-fare. The food is good and the prices are even better (especially for a tourist town). Click here to see the menu. Just down the street a few steps are a few of our favorite restaurants in Springdale, so there is no need to drive to a great meal. If we have some money to treat ourselves, we like to eat at Oscar’s and Zion Pizza & Noodle Co.
You’ll get an amazing view while soaking in the pool or hot tub at the Pioneer Lodge! 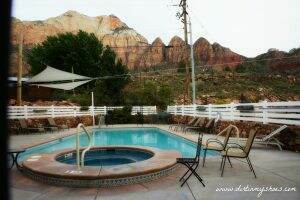 And trust me, you’ll be glad there is a pool on a hot Zion summer day (and a hot tub to soak your tired and achy hiking muscles!). Whenever I travel, I like to feel like I’m experiencing a piece of the community and history. Sometimes we stay in the popular hotel chains, but I generally try to support local businesses whenever I can. Staying somewhere with some history and character is also a fun way to connect with the local area. The Historic Pioneer Lodge was first known as Allred’s and was built in 1934. This was about 15 years after Zion had been designated as a National Park and the town of Springdale was starting to benefit from the tourism. While most of Allred’s no longer exists, the Pioneer Lodge Restaurant located in one of the same stone structures from the 1930’s. The hotel building itself has an old-western feel to it. See if you can find where they have built the hotel around a big and beautiful tree! 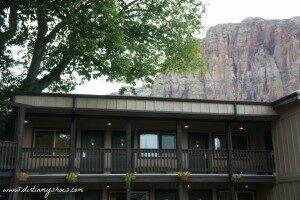 We thoroughly enjoy staying at the Pioneer Lodge whenever we are visiting Zion National Park. 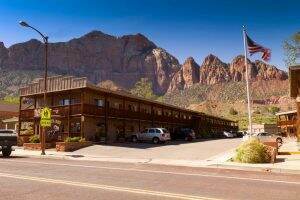 The rooms are clean, the staff is courteous, kind, and helpful (special thanks to Ben and Will), and the proximity to Zion is perfect. 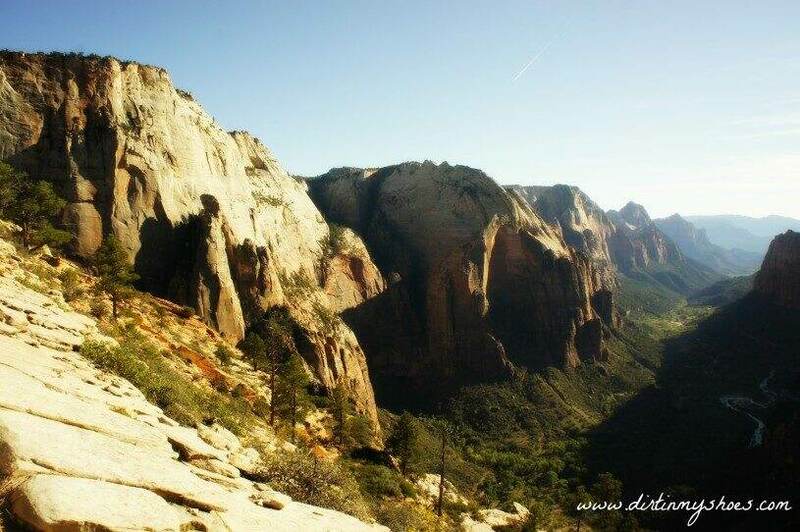 Planning a trip to Zion National Park? Click here to find out more or to reserve a room at the Historic Pioneer Lodge near Zion National Park. Be sure to check out my list of 12 Things You Can’t Miss on Your First Visit to Zion for help with planning your amazing vacation! Disclosure: Our stay at the Pioneer Lodge was hosted by the management for review purposes. All opinions are 100% mine.